So you’ve heard about dental implants and they got your attention? Now you’re still researching implants to find out how you can benefit from getting dental implants? In this article we’re going to present 5 benefits of dental implants that patients can enjoy. So please join us. How can you benefit from having dental implants? 1 You can eat comfortably and at ease. Dental implants function and look like your natural teeth. That means you can eat anything you’d like without having to worry about your implants falling out, coming loose, or breaking. You might not be able to eat with this much ease with other restorative dentistry services. So if you are looking for a long-term solution for your missing teeth problems (or any of the many problems implants can fix), dental implants might be the best solution for you. The only way to find out for sure is to schedule a consultation appointment. This appointment will allow your dentist to perform a thorough dental exam and speak with you about your dental-related concerns. Longleaf Dental can help you determine whether or not you can fully benefit from implants. 2 You don’t have to worry about your missing teeth. We understand that missing teeth can pose many problems in your life. From low self-esteem to a loss of jawbone tissue over time (due to missing teeth), missing teeth is not something you want to deal with. 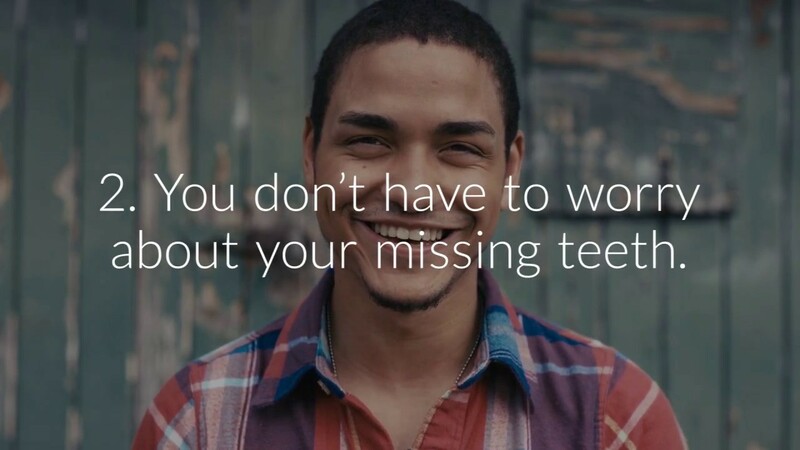 Well, with dental implants, you don’t have to worry about the problems that come with missing teeth. Dental implants are a popular, long-term solution for missing teeth. With implants, you’ll smile proudly instead of hiding your smile because of your missing teeth. 3 If you have dentures, you don’t have to worry about loose-fitting dentures or the other problems that dentures can pose. Some people suffer from the numerous issues that dentures bring to their lives. For instance, the constant application of denture adhesive can become messy and monotonous. Well, with dental implants you can say goodbye to adhesives. Your dental implants will act as your natural teeth. They are implanted securely and solidly into your jawbone for a long-term solution to common dental problems. You can brush and floss as you normally would, but just skip the step where you apply denture adhesives! 4 You don’t have to worry about further bone loss in the jaw region. Some people suffer from bone loss in the jaw region for many reasons. One reason—bone loss can occur when you have missing teeth for quite some time. The bone will deteriorate over time if you don’t take care of it as soon as possible. However, with dental implants, you don’t have to worry about further bone loss. That’s because dental implants stimulate bone growth in the jaw region. More good news for you, right? 5 You can feel confident once again in your smile. Last but not least, you will feel confident with your brand new smile! Your dental implants will look natural and beautiful, complementing the rest of your smile. And if you’re interested in whitening your natural teeth prior to implants, your dentist may recommend doing so before implants are fabricated and placed. Interested in dental implants? Call us today. If you are interested in dental implants and are ready to experience these 5 benefits, schedule your consultation appointment today. If you live in or near Albany, GA and you’d like to schedule an appointment, call Longleaf Dental today. Our contact details can be found on the following page: https://longleafdental.com/contact/. We look forward to speaking with you even more about dental implants and finding out if they are the right solution for you.